I LOVE this book! So much better than the movie. Neil Gaiman rocks! I popped into the cafe today to get a latte and dropped a few books on the shelf. I hope whoever picks them up enjoys! I made a visit to Joshua Tree as I was craving one of their yummy burgers and just happened to find this on the shelf. It has been one that I have been wanting to read. Thanks Minerva101. I love the Stardust movie so was pretty excited when I saw this. Certainly enjoyable but I thought the ending was kind of sudden and in some ways sad. 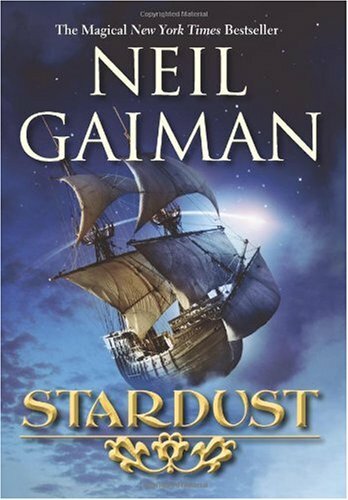 I loved the characters and the world that Gaiman created but I kind of have to admit that I enjoy the movies' ending more (ack, I can't belive I just wrote that, usually I love the books way more). I'm taking this to February's "Unusual Expressions of Love" themed meeting. I think this works. Neil Gaiman is fairly fantastic, so I'm sure this is great, and I have the distinct advantage of having never seen the movie. I really liked this and I loved the writing style which really made it seem like an epic fairy tale. I also found the chapter titles hilarious. Released at the Calgary Bookcrossing Meeting. I picked this up at the May meeting. OK - it is finally read - everyone needs a fairy tale to read when doing drudgery of report cards. Loved the Tristan character - he was delightfully different. Taking this to the July meeting at the Joshua Cafe to either pass on or leave on the bookshelf. I am the next lucky reader! Passed to me at the July Meet-up of Calgary BookCrossers at the Joshua Tree Café. Taken to the October meet-up of the Calgary BookCrossers at the Joshua Tree Café. Who will be the next reader? Just as I loved the movie I also loved the book. What a cute, quick, and fun read. I love the style it's written in. In some ways I perfer the movie and in other ways I perfer the book. Yay for fun fairy tales! Picked up this book at the Calgary BookCrossing March meet-up. I've seen the movie, and now it's time to read the book. I was surprised by how different the book was from the movie. The basic plot is there, but there were a lot of liberties taken. I totally thought the lightning harvesting pirates would play a bigger role in the book - their ship is on the cover - but they're only around for a chapter. Aside from that, it's classic Neil Gaiman. Releasing this book at the Calgary BookCrossing April meet-up. If it didn't go home with someone, it's on the bookshelf. Very imaginative. Enjoyed reading it a lot. One day I came home the pleasant surprise of getting a box of books from the amazing reader_yz. How it just made me smile :) This was one of the books in the box. Returning it to the Calgary group so that it can go to the next reader.